Erva Twisted Forged Wall Bracket, Black, 17"
Hang your bird feeder or planter basket in classic style using this Erva Black Twisted Forged Wall Bracket. This timeless hanger provides a robust display for your hanging accent, thanks to its lasting, square iron body and gently arched silhouette. An upward curl completes the bracket, and a few twists on the item bring a bit of interest and fun to it. This reach allows you to display items up to 29" in diameter, and an extended base and back plate both secure the unit to a wall. Included screws make installation simple, and its dual connections keep the item securely mounted. The black finish remains lovely and classic, and the hand forged, iron construction withstands seasons of use. 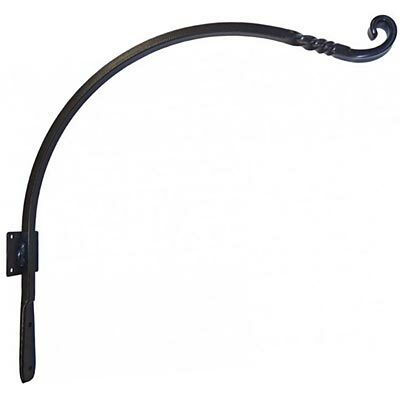 Hang your favorite outdoor accent from a classic bracket using this Black Twisted Forged Wall Bracket. Made in the USA. Erva Twisted Forged Wall Bracket, Black, 23.5"
Erva Twisted Forged Extended Wall Bracket, Black, 30"
Whitehall Ivy Nature Hook, Oil Rub Bronze, 15.25"